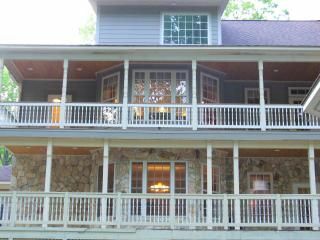 Huge, customized Lake Anna vacation rental, this home offers SEVEN rooms with (2) King; (3) Queen; 1 Double; 1 Single), FOUR Baths (Master Bath with jacuzzi style tub), and a great entertainment space in the basement with a pool table, wet bar, and amazing multi-tiered home theater room. Newly installed satellite internet is now available at the house! Please note that the internet does have a data limit and is not to be used for streaming purposes. Please note that while this home is close to several Marinas, it is NOT a lakefront home. Access to the lake within the neighborhood has been designated for homeowners only by the neighborhood's HOA. The owners do own a boat slip on the warm side of the lake with excellent amenities including a pool, beach, and tennis courts all located within a short 8 minute drive from the house. Please inform Julie if you wish to access these amenities during your stay. Outside, enjoy two levels of decking with beautiful views of the large pond, complete with two waterfalls. Enjoy your evenings in all seasons in the gazebo that has a fully functional stone fireplace! To complete your outdoor experience this home also has a custom built tiki bar and a fabulous hot tub. Three finished levels of living space makes your stay comfortable and spacious for groups of all sizes. Huge, finished room above the garage with half bath with California King available for additional fee. The garage is connected to house with a covered breezeway. * NO fishing, swimming, or diving in pond. Keep children off the rocks near the pond. There is now satellite internet available at the house! Please note that the internet is not to be used for streaming purposes. Main kitchen has coffee maker, Keurig in kitchenette on the ground floor. Electric stove/oven combo, pots and pans, cooking utensils, coffee maker, toaster, microwave, dishwasher, sink with "Pur" water filter. Located on the second floor "main level". The bottom floor has a kitchenette, shower, and two bedrooms that would be suitable accommodations for a wheelchair. However the upper two floors are not accessible by wheelchairs. PLEASE NOTE THAT THERE IS NO INTERNET AT THIS RENTAL!!! The lake is all around you but you do NOT have access to the lake from the house. House Located In Lake Front Community. There are four streets in community but access to water/lake at Community Area is limited to homeowners. Boat rentals (canoes, jet skis, pontoon and power boats, etc.) are available at several marinas. There are brochures at the house to assist you with securing boating entertainment. For awesome swimming, try Lake Anna State Park. The park has lifeguards, a huge beach, large concession area with full service bathrooms and showers overlooking beach, etc. Conveniently located just minutes from the house!!! (WE REIMBURSE UP TO FOUR ENTRANCE FEE COSTS FOR THE STATE PARK BEACH). The house was great and perfectly accommodated our group of 10. We especially enjoyed the home theater for watching football and movies. Our host was incredibly responsive and could not have been better. Definitely recommend! Great house for multiple families in a quiet location. Great folks to work with! Our family enjoyed the holidays. The entertainment area on the bottom floor was a huge draw for the teenagers in our family. Awesome, comfortable & spacious. I love this property. My third time staying here! My anniversary and husband’s birthday weekend was so much fun. The theater room and gazebo were two highlights for me, the host is very nice and accommodating. Definitely recommend this property for an amazing getaway location. The property was perfect for a visit with extended family. We really enjoyed the game room! We had a great week visiting with family. We celebrated a 50th Birthday, and had lots of fun catching up with cousins! The game room was perfect for our family as we love to play board games- and play pool! We had such an amazing time here last weekend! Everything was wonderful and the house was perfect for our graduation celebration/family reunion. The house was gigantic and had so many different rooms and activities to keep everyone of all ages occupied and having a blast (movie room, huge porches, hot tub, gazebo, bar areas, etc.). I would highly recommend this home! Just as a heads up to the owner, I had some complaints that the bedsheets were not in the respective bedrooms. Also, despite the helpful explanation about how to use the media room, we still had some trouble getting it to work at times! Other than that, everything was great! Certainly a wonderful boating (and unique lake BEACH) vacation! With the large game room, home theatre and outdoor fireplace, you have your choice of activities. There is a new hot tub and an outdoor "tiki" bar at the house! Please note that while this home is close to several marinas, it is NOT a lakefront home. Access to the lake within the neighborhood has been designated for homeowners only by the neighborhood's HOA. On shore and off shore gas stations, grocery stores, and convenience stores are in close proximity. Lake Anna Yacht Club has new facilities with multiple dining choices. Tim's River Shore has water-accessible seafood dining! Day trips to Washington D.C., Colonial Williamsburg, Kings Dominion Amusement Park, Skyline Drive. James River kayacking, and so much more. Lake Anna Winery - (Summer) Enjoy the Virginia Renaissance Faire. (Fall) Oktoberfest activities. Wine Tasting is year round! Additional Civil War Historic Sites - Historic Fredericksburg ("olde town" shopping and even lunchtime boat tours on the Rappahannock River). Jamestown. HOLIDAY RATES ARE $500.00/NIGHT. This includes: Memorial Day, Labor Day, Fourth of July, Thanksgiving, Christmas, New Year's, Easter For Summer rentals we WILL consider 4 night rentals at $400/night. Rentals less than 4 nights will not be considered. The $50 Sheet fee includes a top sheet and fitted sheet for each bed in the house, excluding the California King in the room over the garage. This is a bonus room and is not included in the total number of bedrooms in the listing. Guests will still need to bring pillowcases if you would like to use the house pillows, and towels.